Support your downtown by keeping in touch with community events. ​On September 12th, 2016 and on September 26th, 2016, Save Our Downtown invited the six candidates running for Council and the two candidates running for Mayor to respond to a set of 14 questions. All but one attended. We recorded their answers to these questions and then made our endorsements. We endorsed Mila Vilavich-LaBarre and Mike Clark for Council. We were unable to arrive at a consensus regarding which of the two candidates for Mayor we could endorse. Our reasons were as follows. We felt the other Council candidates were out of their depth when answering many of our questions. Mike and Mila were the two most articulate and well-prepared candidates interviewed. The questions we asked each candidate are listed below. Would you support incorporating into the Downtown Core urban design considerations which go behind the Community Design Guidelines (such as form-based codes)? Background: The City is envisioning, but has not committed to, a Form-Based Code for the downtown as a City-led process in conjunction with Cal Poly. The effort would be informed by and follow the completion of the Downtown Concept Plan. In lieu of developing and adopting a Form-Based Code, Save Our Downtown is recommending that our Community Design Guidelines be incorporated into our more enforceable Zoning Regulations. On the PC there are only three professional planners among the seven members. On the ARC there are only two architects among the seven members. On the CHC there is only one member with a background in history (and that’s not even “architectural history”) among the seven members. And on the Tree Committee there are only three members with a background in forestry or biological sciences among the seven members (see below for more detail on this). Should City planners avoid employing a strict interpretation of the Community Design Guidelines in order to mitigate the substantial costs and delays incurred by the developer? Background: Through Senate Bill 226, the State of California, along with our Governor, is supporting expedited assessments of urban infill projects or “categorical infill development exceptions” within existing neighborhoods because there is the mistaken belief that truncated planning will bring down the cost of housing. We oppose circumventing the planning process as a means to reduce the developer’s costs because there is no guarantee that the developer will pass on these cost reductions to the public. limiting the number of bars/ restaurants with bars in downtown? Background: The approved work scope for the Zoning Regulation Update includes the following: 2.7.26 LUE Program 4.32 “Alcohol Use Permits” “The City shall incorporate into its zoning regulations specific criteria for evaluating use permits for bars/taverns, night clubs and late night drinking establishments.” However, not included in the Zoning Reg Update work scope is LUE 4.29 “Coordination of Late Night Environment” which would enact additional regulations on Downtown drinking establishments, nor was there any mention of the inclusion of a much-promised “Public Convenience and Necessity" (PCN) policy which would give the City legally-defensible criteria for permitting or not permitting alcohol outlets downtown. (downwards) the Downtown height ordinance? include relevant parts of the Community Design Guidelines? proactive role in the designation of Heritage Trees, in protecting trees in new developments, in setting its own agendas and in advising other advisory bodies? Do you agree that the City should change the name of the Cultural Heritage Committee to Cultural Heritage Commission and vest the Cultural Heritage Commission with final review authority over designations and permit reviews, with appeal to the City Council or the courts? documents. What do you think of this? workshops and awareness walks conducted by S.O.D. and other interested groups? illustrate to the public the actual proposed height of a structure? On May 7th, 2012, Save Our Downtown held a "Cash Mob," an event that gathers community members together through word of mouth and social media to shop and provide a boost to a local business. 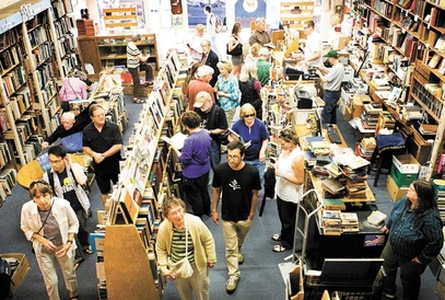 The event drew more than 50 participants, who each spent a minimum of $10 on books. In a pleasant but perhaps unsurprising outcome, the enthusiastic chatter of participants created a lively atmosphere of discussion and community that is quintessentially San Luis Obispo. 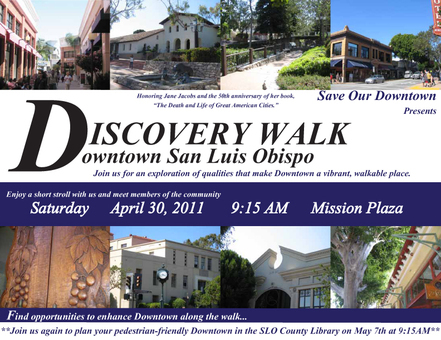 On April 30th, 2011, Save Our Downtown hosted more than 30 locals to a walk around Downtown. From residents to students, City officials to neighbors, design enthusiasts to transportation planners, everyone was invited to learn a little and share a little about their perceptions of the Downtown. Our shared experiences revealed the important qualities that make location a special place and the features that could further amplify the core features of this charming environment. Recurring statements about the features of Downtown are listed below. Where seating, both public and outdoor dining, are present. Where natural elements like the creek, creek sounds, and greenery are present. Where there are other people. 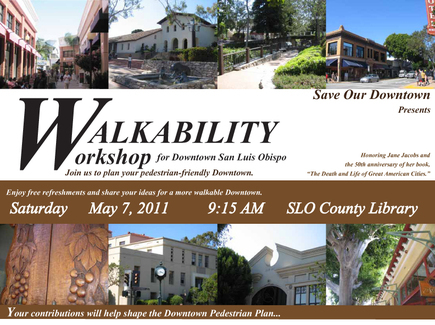 On May 7, 2011, Save Our Downtown hosted a workshop to gather citizen input about elements that would create a more pedestrian-friendly environment in Downtown.